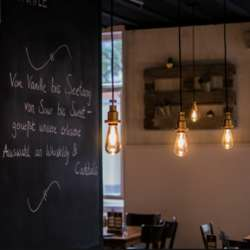 Join us and share some drinks at an elegant location - mix and mingle with fellow global minds and expand your social and business networks at one of the most exclusive locations in Freiburg, Das Quartier. Spread the word, bring your friends and coworkers to socialize, mix, and mingle with a bunch of wonderful international crowd as well as the locals. But don't forget to invite them to sign up for InterNations first. COMING SOLO? New in Freiburg/to InterNations? Your first event? Wonderful! Just let us know. We'll introduce you and help you intermingle. Last but not least, we want to remind all our members that an accurate guest list is important. Please be considerate and only register for this event if you really intend to come! In case you are not able to attend because your plans changed, then you are hereby asked to cancel your online reservation at least 24 hours in advance.